At this time of the year we often do a bit of mild twitching – going specially to see an unusual bird that has been reported locally. Three or four Cattle Egrets had been reported in Kew on Saturday, which were probably the same ones as we saw last year at Marshside. But a new year and a new tick! Before we set out we looked at the trees in Williamson Square, to start our 2018 tree list. There are six Ginkgoes outside what used to be Stoniers, and three Holm Oaks outside the football shop. But what are the other two there, and the one in Queen Square in the corner by New Look? They appear to be of the same species, but we puzzled over them all last year when they were in leaf. They have yellow-green pinnate leaves, but they definitely aren’t Ash. Could they be False Acacia (Robinia) or Honey Locust (Gleditsia)? One of my Christmas books was “London’s Street Trees” where I read that the Japanese Pagoda Tree Styphnolobium japonica is newly in fashion as a street tree and is often mistaken for the two I named above. So it that what they are? The way to tell is if the new shoots are a dark bottle green, but we peered at the bare twigs from all angles and couldn’t see any green. Maybe the new spring growth will be green. We enjoyed the long bus ride up through Lydiate and Halsall, spotting crops of cabbage and sprouts still in the fields. It was cold, but bright and sunny. In Kew we headed down Bentham’s Way, past Dobbie’s garden centre, detouring briefly to look in Fine Janes Brook. There was a Moorhen and a Mallard, with a Kestrel hovering over the rough grass. 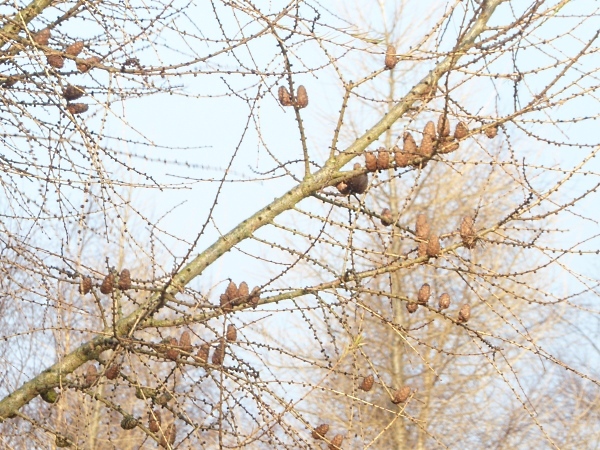 We were able to identify some winter trees – Alder with its dark purplish catkins and cones, Ash with last year’s keys and black buds, Horse Chestnut with their sticky buds and horseshoe-shaped leaf scars. The young pines were Scots, not Corsican, identified by their narrow pointed cones, which point downwards in their second year. There was also a Larch, with small cones scattered along the twigs. 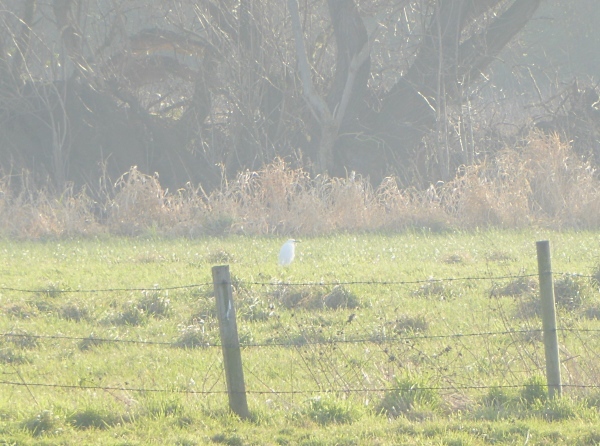 We arrived at the target field on Bentham’s Way, opposite Christ the King school playing fields, and there was a single Cattle Egret at distance, right against the sun, and looking like a hunched over Little Egret, but that’s our tick! In the playing field were the usual Herring Gulls, Black-headed Gulls, Carrion Crows and Starlings, and also a single Common Gull and a few Oystercatchers and Curlews with their heads down, probing the short grass. 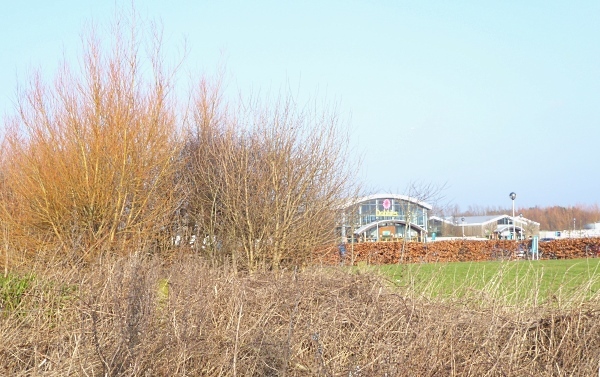 On the way back to Kew woods, we admired the orangey twigs of the bare Willows and the coppery dried leaves of the Beech hedge outside Dobbies (see top picture). After lunch we walked around the “woods”, which are still mostly low scrub. 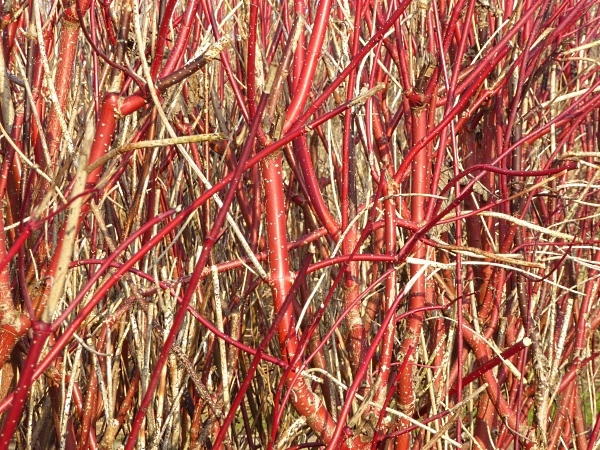 A Robin flitted around the hedges and we admired the bright bark of the red-stemmed Dogwood. One young tree of the Cherry type had a most unusual trunk. 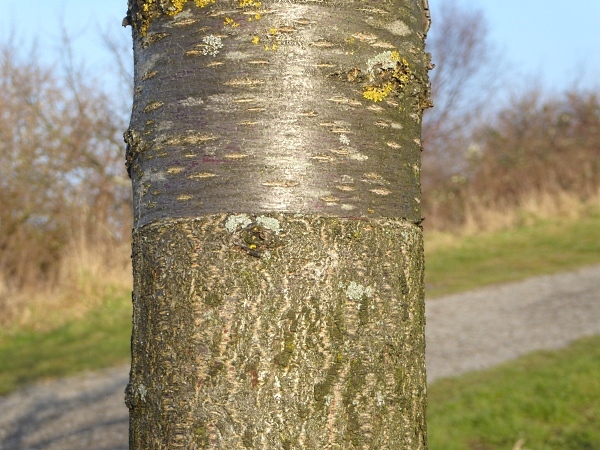 Half way up it the bark changed, as if it had been grafted, but there was no lumpy graft scar. What happened there? 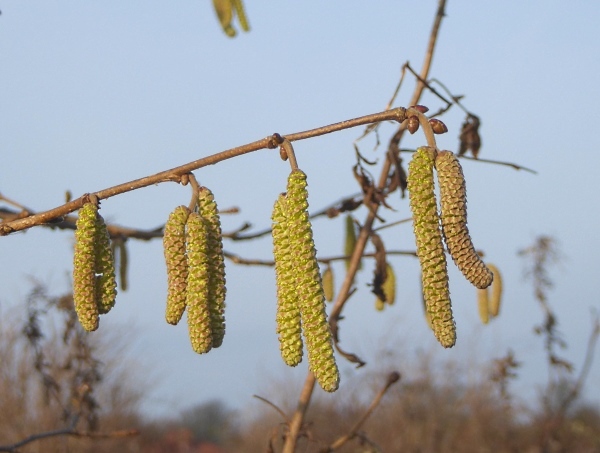 And more catkins, this time probably of Hazel, because there were no Alder cones, and the catkins were yellowy-brown. Then we headed into Dobbies for loos, tea and cake. 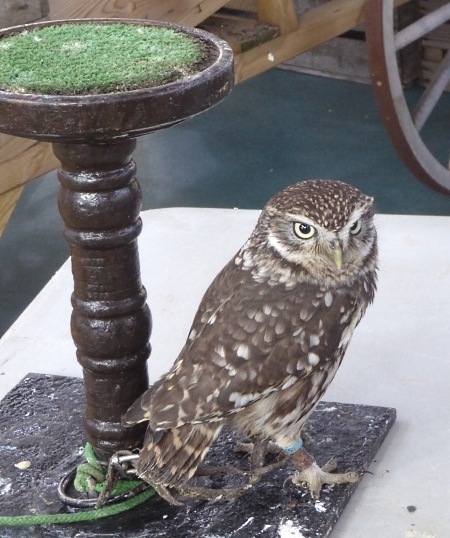 S & R Raptors were displaying their American Kestrel, Barn Owl and this fierce Little Owl. 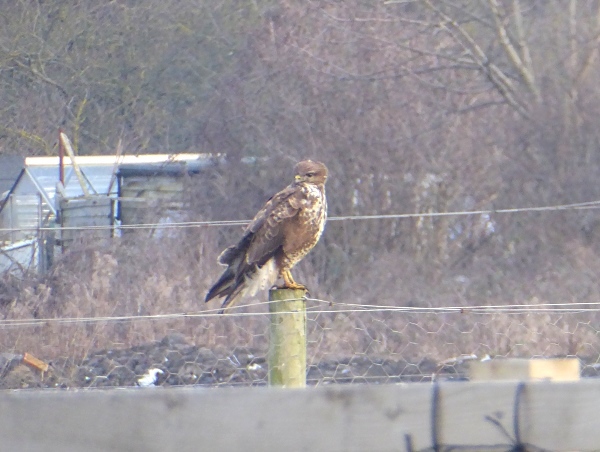 As we were waiting outside Dobbies for the bus into Southport, a Buzzard flew in and sat on the fence on the other side of the road, completely unfazed by all the traffic going past. Public transport details: Bus 300 from Queen Square at 10.25, arriving Town Lane / Town Lane Kew at 11.35. Returned on the 44 bus from Town Lane Kew / Bentham’s Way at 2.32, arriving Southport Eastbank Street at 2.48, and we just made the 2.58 train from Southport Station back towards Liverpool.